Washington Free Beacon Iran Conducted Cyber Hacks on U.S.
Witt was deployed to several overseas location to conduct "classified missions collecting signals intelligence," including those of adversaries. Witt had access to "classified information, including details of ongoing counterintelligence operations, true names of sources, and the identities of U.S. agents involved in the recruitment of those sources," according to the indictment. "In or around January 2012 to in or around May 2015, in Iran, and elsewhere outside the jurisdiction of any particular State or district, defendant [Witt] did knowingly and unlawfully combine, confederate, and agree with other persons, both known and unknown to the grand jury, including officers of the IRGC, to knowingly and unlawfully communicate, deliver, and transmit to a foreign government, specifically Iran, and to that foreign government’s representatives, officers, and agents, directly and indirectly, documents and information relating to the national defense of the United States, with the intent and reason to believe that the same would be used to the injury of the United States and to the advantage of Iran, in violation of Title 18, United States Code, Section 794(a)," the indictment alleges. The sanctions hit an Iranian-based entity tied to the country's Revolutionary Guards Corps, or IRGC. This includes "efforts to recruit and collect intelligence from foreign attendees [of various conferences], including U.S. persons, and four associated individuals," according to the Treasury Department. 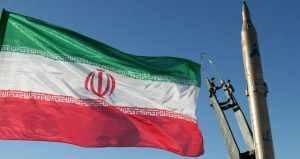 Sanctions also were leveled on "a separate Iran-based entity and six associated individuals involved in the targeting of current and former U.S. government and military personnel as part of a malicious cyber campaign to gain access to and implant malware on their computer systems." The revelation of Iran's sophisticated cyber espionage operations comes as Secretary of State Mike Pompeo helms a major ministerial gathering in Warsaw aimed at countering Iran's malign activities across the globe. It is likely Tehran's cyber operations will be a topic of conversations in the wake of these disclosures. "Treasury is taking action against malicious Iranian cyber actors and covert operations that have targeted Americans at home and overseas as part of our ongoing efforts to counter the Iranian regime's cyber attacks," Treasury Secretary Steven Mnuchin said in a statement. "Treasury is sanctioning New Horizon Organization for its support to the IRGC-QF. " "New Horizon hosts international conferences that have provided Iranian intelligence officers a platform to recruit and collect intelligence information from attendees, while propagating anti-Semitism and Holocaust denial," Mnuchin said. "We are also sanctioning an Iran-based company that has attempted to install malware to compromise the computers of U.S. personnel." Treasury coordinated with DOJ and the FBI, which separately announced the indictment of the Iranian defector.